The preseason No. 1 team in college basketball last season played in the Big 12, but it was upstart Texas Tech that had the best NCAA Tournament run of any team in the conference as the Red Raiders finished as national runners-up. Because of their regular season and postseason success, especially compared to Texas Tech’s preseason expectations and roster turnover in the offseason, their season gets a grade of an A+. Here are Stadium’s postseason grades for every team in the Big 12, which take into account the Big 12 preseason poll, conference and NCAA Tournament finishes, and recent program trajectories. The teams are listed alphabetically below. After entering the 2018-19 season with the Big 12 preseason poll picking the Bears to finish ninth in the Big 12, they finished fourth in the conference – despite losing starting forward Tristan Clark for the season after just 14 games. Baylor led the Big 12 in offensive efficiency, offensive and defensive rebounding percentage and 3-point percentage, as the Bears’ small-ball lineups and zone defense fueled a 10-8 record in conference play. They earned a No. 9 seed in the NCAA Tournament and they beat Syracuse in the first round before falling to No. 1 seed Gonzaga. 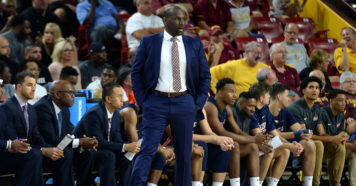 The Cyclones were inconsistent in 2019 and it was on full display in the final two weeks of their season, when they won the Big 12 Tournament only to lose to No. 11 seed Ohio State in the first round of the NCAA Tournament. At their best, they beat Texas Tech and Kansas State on the road. At their worst, they lost their final three (and six of their last eight) regular season games. But Iowa State still had a solid 2018-19 campaign, finishing in fifth in the Big 12 – one spot ahead of its spot in the conference’s preseason poll. The Cyclones had one of the 10 most efficient offenses in the country thanks to a handful of efficient and/or high-usage guards and wings in Marial Shayok, Tyrese Haliburton, Nick Weiler-Babb, Lindell Wigginton and Talen Horton-Tucker. After a six-year NCAA Tournament streak ended in 2018, getting back to the Big Dance as a No. 6 seed in 2019 was a positive development for the program. The Jayhawks were the preseason No. 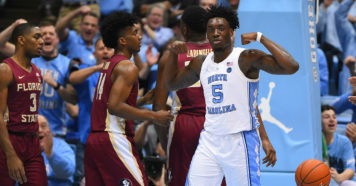 1 team in the AP Top 25 Poll and they played like it initially, winning their first 10 games, which included victories over Michigan State, Marquette, Tennessee, Wofford, New Mexico State and Villanova. But then center Udoka Azubuike suffered a season-ending injury, forward Silvio De Sousa was ruled ineligible for the season and guard Lagerald Vick took a leave of absence. A 15-2 start spiraled into an 11-8 finish during Kansas’ final 19 games. The Jayhawks struggled on the road, which ultimately led to the end of Kansas’ 14-year streak of winning at least a share of the Big 12 regular season title. The season ended in an 89-75 loss to Auburn in the second round of the NCAA Tournament. Sure, the season was disappointing for a Kansas team that received eight of 10 first-place votes in the Big 12 preseason poll and was one of the favorites last fall to cut down the nets, but given the team’s personnel losses, a 26-10 season that ended with a No. 4 seed in the NCAA Tournament and one win in the tournament before losing to a Final Four team in Auburn should not be viewed as some colossal failure. While Texas Tech had the best NCAA Tournament showing of any Big 12 team, Kansas State was alongside the Red Raiders atop the conference’s regular season standings as the Wildcats helped end Kansas’ streak of regular season titles. The Wildcats were picked to finish second in the Big 12, behind Kansas, in the preseason poll and they received two of the 10 first-place votes. So in that regard, Kansas State actually overachieved. Kansas State, which was without its leading rebounder and second-leading scorer Dean Wade in the NCAA Tournament, was upset by No. 13 seed UC Irvine in the first round, which was certainly a disappointing ending for a team that was coming off of an Elite Eight run the year before. But the Wildcats’ 2019 campaign was largely a success thanks to the senior trio of Wade, Barry Brown and Kamau Stokes, even if they didn’t quite live up to their preseason No. 12 ranking. Despite losing do-it-all point guard Trae Young after the 2018 season, Oklahoma improved its NCAA Tournament seed by one seed line and its final ranking on kenpom.com was 16 spots higher in 2019. The Sooners were picked to finish eighth in the Big 12 and they tied for seventh, before earning a No. 9 seed in the NCAA Tournament. Their defense saw a major improvement from a No. 85 ranking in adjusted defensive efficiency in 2018 to No. 23 last season. 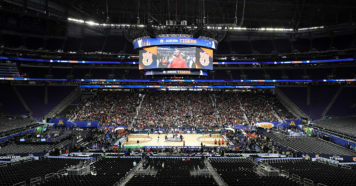 In the NCAA Tournament, Oklahoma ran Ole Miss off the floor in a 95-72 win before losing to eventual national champion Virginia in the second round. Thanks to West Virginia’s underwhelming season, Oklahoma State finished in ninth in the Big 12 – one spot ahead of where it was picked in the preseason poll. Three players – Michael Weathers, Maurice Calloo and Kentrevious Jones – were dismissed in January and the Cowboys finished the year with a 12-20 record (5-13 Big 12). Remarkably, Oklahoma State beat SEC co-champion LSU by 13 points on a neutral court in November, and had solid wins over Texas and Baylor, but there were very few bright spots besides those victories. While the Cowboys’ 3-point shooting (37.2%) was impressive, Oklahoma State took a step back in Year 2 under Coach Mike Boynton. The Horned Frogs were among the First Four Out as they narrowly missed out on qualifying for the NCAA Tournament. A 20-13 record (7-11 Big 12) on Selection Sunday wasn’t enough as TCU’s resume lacked quality wins outside of season sweeps of Iowa State and Texas, and a win over Baylor. The season-ending injury to point guard Jaylen Fisher, who announced his decision to transfer mid-season, certainly changed the trajectory for TCU, but tying for seventh in the conference after being picked in the preseason to tie for fourth was a disappointing conclusion. The Longhorns won the NIT in 2019, which isn’t the type of postseason success Texas aspires to have. It was the second time in Coach Shaka Smart’s tenure in Austin that the Longhorns have missed the NCAA Tournament. They were 16-16 on Selection Sunday after going 8-10 in the Big 12 and losing to Kansas in their first game in the Big 12 Tournament. Texas finished 6th in the Big 12 after being picked to tie for fourth in the preseason poll. The computers liked Texas – the Longhorns were in the top 30 nationally in adjusted offensive and defensive efficiency – but its resume was lacking despite wins over North Carolina, Purdue, Kansas State, Kansas and Iowa State. The Red Raiders were picked to finish seventh in the Big 12 preseason poll after they lost five of their top six scorers from their 2018 squad that made the Elite Eight. All Texas Tech did in the six months that followed was win a share of the Big 12 regular season title, ending Kansas’ 14-year streak of winning at least a share of the regular season championship, then the Red Raiders advanced to the national championship game, where they lost in overtime to Virginia. So Texas Tech’s season was a resounding success, but it was all the more impressive because of the combination of the production the team had to replace, the school’s lackluster men’s basketball history before Coach Chris Beard’s arrival and its low preseason expectations. Texas Tech’s adjusted defensive efficiency was 84.1, which is the best in the 18-year history of kenpom.com. The Red Raiders weren’t just good on that end of the floor, they were generationally elite. The Mountaineers were picked to finish third in the Big 12 preseason poll, and they debuted at No. 13 in the AP Top 25 Poll. They finished with a 15-21 record (4-14 Big 12) in a season that included the dismissal of Esa Ahmad and Wesley Harris, an injury and eventual departure from guard James “Beetle” Bolden, and rim-protector extraordinaire Sagaba Konate being limited to eight games due to injury. West Virginia lost 12 of its first 14 games in Big 12 play, but managed a few nice wins at home over Kansas, Iowa State and Oklahoma. It didn’t win a road game all season. A win over Texas Tech in the Big 12 Tournament offered a glimpse of hope that the Mountaineers could steal an NCAA Tournament bid, but their season ultimately ended in a home loss to Coastal Carolina in the second round of the CBI. West Virginia continued the Bob Huggins tradition of being a top-10 team nationally in offensive rebounding, but that was one of the few positives statistically or otherwise for the Mountaineers.